Millions of 12-Volt lead-acid batteries are disposed of each year as they fail to hold a charge and are assumed useless. However, as many as 70% of these batteries can be recovered resulting in fewer new batteries purchased, a decrease in maintenance hours and a reduction in hazardous waste disposal handling and fees. Recovering batteries not only makes sense financially, but also contributes to a company's sustainability effort. One major trucking company had a stockpile of 616 12-Volt batteries they thought were unusable until they discovered our products. 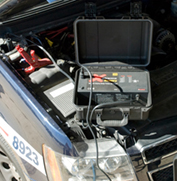 Within 6 months 58% of the batteries were recovered and kept in service at a cost savings of over $40,000. The Marine Corps Air Ground Combat Center 29 Palms (MCAGCC 29 Palms) have been recovering lead-acid batteries with PulseTech's products since 2008 and has experienced a reduction in the number of new batteries they now need to purchase. In addition, since the lead-acid batteries are reused instead of recycled this installation has reduced hazardous waste generation by 60% and eliminated the associated disposal fees. The MCAGCC 29 Palms program has reconditioned approximately 10,700 batteries since its inception, saving the installation approximately $2.39 million over the past three fiscal years. Read the complete article in Pollution Prevention Magazine. Recovering batteries makes sense from both a fiscal and environmental point of view. 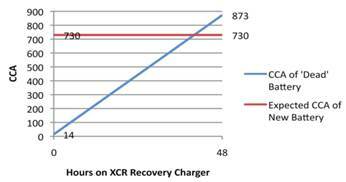 To demonstrate the effectiveness of the XCR recovery charger to one of our distributors, we took it to their branch where they picked a dead Decka 730 CCA battery from their return pile. Within 48 hours the battery was returned to better than new condition. CCA went from 14 CCA to 873 CCA – higher than the expected 730 CCA of a brand new battery. The battery voltage went from 10.55V to 12.98V. 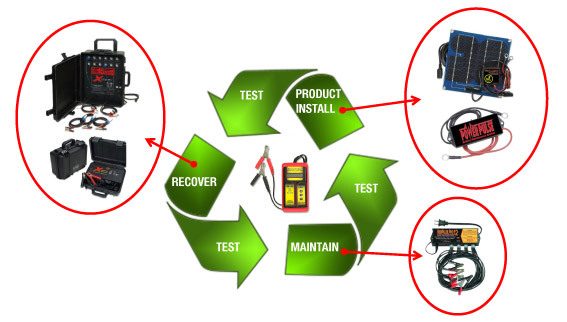 Achieve immediate cost savings and a reduction in hazardous waste generation by recovering dead batteries with PulseTech's Battery Management Program.